The Savannah River Landing, a mixed-use development planned for the east end of President Street, has moved one step closer to reality. The sale of the 57-acre site closed last month for $30,125,000. 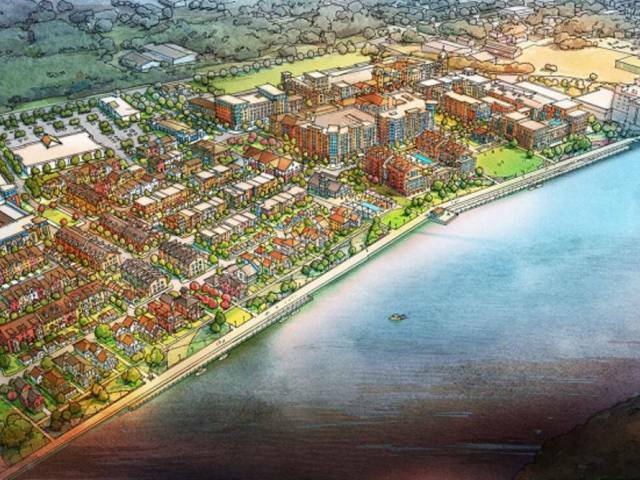 The site plan, which will include retail and office space along with hotels and residences, is being developed by Savannah River Landing Land JV, LLC — a joint venture comprised of Regent Partners and Mariner Group, the company that developed $41 million Mariner Grove Apartments on President Street. Both firms are based in Atlanta and had been pursuing the deal since 2012. The first phase of the new plan will include 600- to 700-space municipal parking deck, 20,000 square-feet of retail space, a 160-room boutique hotel and 300 units of multi-family residences with a dedicated parking structure. The public parks, squares and much of the planned green space will also be included in phase one. Atlanta-based Patrick Malloy Communities are set to begin construction on the single-family residential component of the project on the eastern end of the parcel this winter.